Time is one of the most precious commodities in someone’s life and since time cannot be reversed it is always important to have a wall clock in your house or office that will help you to manage your time. Many people who have incorporated this idea in their lives have always been successful. Do you love mathematics? or are you an engineer and you are looking for the best office clock that will change the look of your office or house? 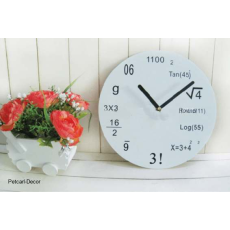 If you love Mathematics then an acrylic mathematics wall clock is what you need on your wall. It is a white wall clock that is designed to perfection. It is also a durable clock that is not only beautiful on your walls but also an educating clock and especially to kids. Give your office or house a new look by acquiring an acrylic Mathematics wall clock from Petcarl Décor.